Today marks the start of Prime Day 2018, which can only mean one thing: you’re about to buy a whole bunch of awesome new gadgets. Of course, several of them are likely to have expandable storage, especially if you take advantage of Amazon’s insanely low pricing on hot items like the Kindle Paperwhite, Kindle, and Fire HD 8 Tablet. 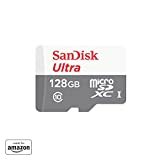 We’ve combed through all the sales on Amazon’s site right now, and we’ve identified the single best Prime Day 2018 deal on a microSD card: a SanDisk 128 GB micro SD Memory Card for just $23.88. It’s a special version of SanDisk’s Ultra line of cards that’s certified by Amazon for Fire tablets and Fire TVs, but it’ll obviously work in any device with a microSD card slot.